Up to the mid 1920's horse-drawn traffic was a regular feature of Watton High Street. With drivers Harry Ward, Don Moore, Bob Spencer, and lots of others, high carts with high-stepping horses were used to deliver bread, meat and groceries. Slower, heavy horses pulled dray- like flat-bottomed coal carts, and farm produce and supplies rumbled through the town in wagons or tumbrils. A wagon was four-wheeled, low-sided, long and narrow, pulled by two horses or more, and a tumbril, more usually called "th' ole tumbler" was a two-wheeled one- horse job. There was another strange agricultural vehicle which was built like a tumbril, but had front wheels and extension sides like a wagon; this was promptly christened "a ole harmadite" (hermaphrodite) because, as the local lads used to say, "that ent neither one thing nor tha other". One horse enterprise did survive long beyond its normal span. Archie Manning, milkman and everybody's friend, liked horses He did not like motor cars, and Archie and his faithful pony were delivering milk in Watton until they both retired. 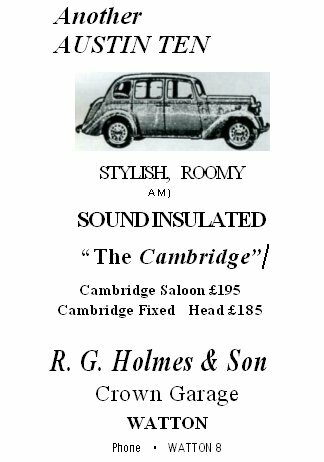 1938 ADVERTISEMENT NOTE THE PRICES AND THE TELEPHONE NUMBER! Many changes, however, were taking place. Austin Sevens, Morris Minors, 5-hundredweight vans were beginning to appear, and, as always new facilities and services also appeared to accommodate this new breed of transport. Frank Dye, not long returned from the First World War opened a garage with Ford dealership in a small building at the corner of Church Road and Norwich Road. This building is still part of the very extensive used car showrooms which is incorporated into the Frank Dye Ltd garage and agricultural machinery complex now directed by Noel Dye, a son of the founder. At quite an early stags in the development of the business Frank Dye introduced what was, in this area the first on-farm tractor repair service. A telephone call would send tractor mechanic Percy Button and his little van on their way to minister to plugs, clean carburettors and to give the mechanical kiss of life to a stubborn lump of machinery standing in the corner of a wind-swept field. Two other garages opened about the same time. One, at the Crown was on part of the site now occupied by the International Stores precinct. It was entirely appropriate that the Crown should retain an interest in transport because George Jacobs, a previous landlord was also a horse dealer of international repute and rumour has it that he "supplied horses to the crowned heads of Europe".